Calling all stoners and cannabis enthusiasts! 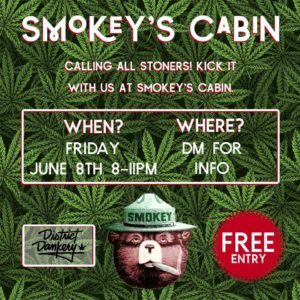 Smokey’s Cabin is the coziest stoner crashpad you’ve never seen. Come and explore forests of Smokey’s premium flowers, concentrates sweeter than honey, and edibles galore. Bring your friends and dont miss out on the coziest event in the city.